At the same time as China renewables grow, the absolute amount of China coal fired generation will continue to skyrocket. 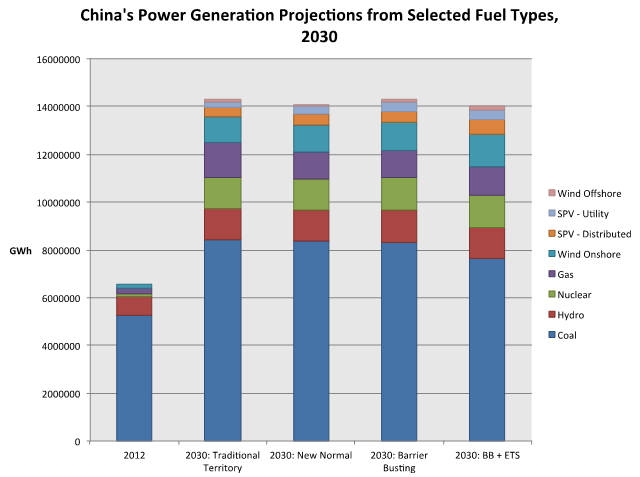 According to Bloomberg, 343-450 Gigawatts of new coal generation will be built in China over the next fifteen years, more than the total capacity of the entire current US coal fleet, which is roughly 300 Gigawatts. Put another way, even in the Bloomberg best case, with the most aggressive solar and wind investments in the world, China will continue to bring on line roughly an average of one large 500 MW coal plant per week through 2030. This is on top of China's existing 750 GW coal fleet, already more than twice the size of America's.